Wes Myers, shop service technician from San Antonio, Texas, is interviewed as part of an upcoming episode of Military Makeover: Operation Career on Lifetime Network. Filming took place in Lancaster, Pa., at the new Terex Service Center. 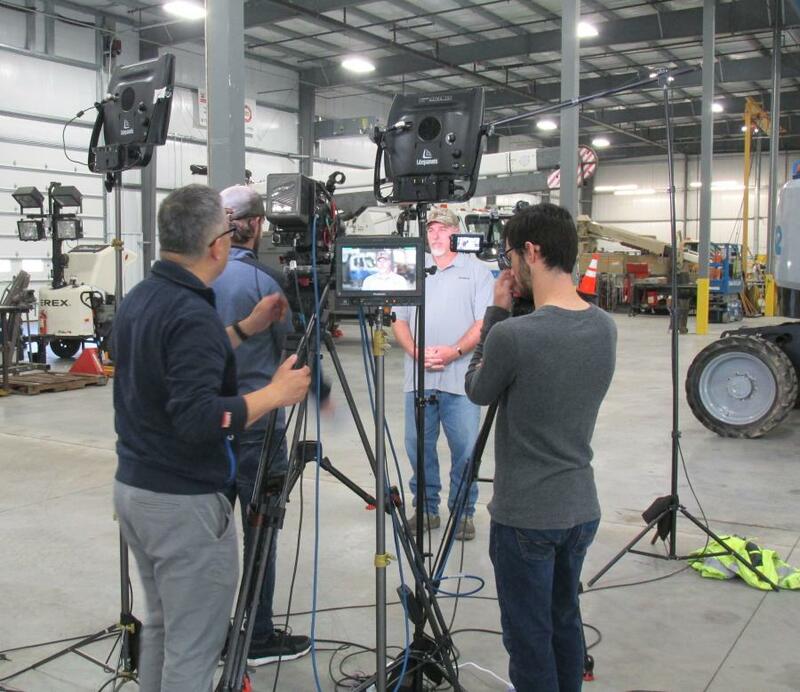 Five Terex service center team members were recently interviewed for an episode of Military Makeover: Operation Career, to air on the Lifetime Network on Dec. 20 at 7:30 a.m. EST. The television series highlights military veterans who have transitioned out of the military into successful civilian careers. The Terex team members who were filmed for the show previously served in the U.S. Marines, Army, Navy and Air Force. "Military veterans with technical skills are a great fit with Terex Services. Terex needs diversely talented shop technicians and mobile field service technicians to serve customers," said Richard Gunderman, VP Parts & Services of Terex Utilities, who is himself a veteran of the U.S. Marines. Gunderman has worked for Terex for more than 18 years, holding various roles in customer services, materials and operations. In addition to Gunderman, the other Terex team members who participated in filming the episode are Travis Robinette, shop service technician from Glen Allen, Va.; Wes Myers, shop service technician from San Antonio, Texas; Amber Barrows, branch operations specialist from Lancaster, Pa.; and Robert "Butch" Beach, field service technician servicing Alabama. Barrows served in the U.S. Army for 2-1/2 years as a medical supply specialist — making sure that the people on the field and the base hospital had the correct medical supplies. She has been with Terex for almost eight years and is currently the branch operations specialist. As a female veteran transitioning to the civilian workforce, it was important to find an employer that was a good fit. Terex has been recognized by multiple organizations for being among the best places to work for women, including a 2018 ranking by Fairygodboss, based entirely on employee reviews, and a 2016 accolade by Women Engineermagazine. "I am honored that Terex thinks so highly of me and my contribution to the company," said Beach upon being included in the filming of the television show. "As a field service technician, I enjoy the flexibility to be my own boss, with control over my schedule and coordination of work responsibilities," said Beach. The need for skilled workers in all segments of industry, including manufacturing, continues to grow along with the U.S. economy. For the first time, there are more job openings than eligible workers to fill them. "Terex provides ongoing technical training to develop team members' skills, and encourages continuous improvement by offering free courses to team members through Terex University," said Gunderman. "Many of the company's values align with those of military veterans — diversity, safety, servant leadership, courage. It is an exciting time to be part of the expanding manufacturing and services sector. Terex is a place where you can work and grow," he said. Beach advises other military veterans as they prepare to transition to civilian careers: "Believe in yourself and the drive to excellence that the military instilled in all of us. Don't forget the job training that was given during your time in the military and the ability that you have to adapt to any life scenario put in front of you." The Military Makeover: Operation Career episode featuring Terex Team Members will re-air on Dec. 25, Jan. 16, and Jan. 22 at 7:30 a.m. EST. For more information on Terex Utilities, visit www.terex.com/utilities.